Come visit the beautiful wilderness surrounding Buckhead Ridge Resort. We have many trailer units and RV lots available for travelers from all over the country. We have a Thanksgiving Dinner, Christmas Eve w/Pizza and Christmas Bingo, Christmas Dinner, a Bean Dinner, Fish Fry, and Hot Dog Ice Cream Social. Come and enjoy the beautiful nature of Okeechobee, Florida. Buckhead Ridge Resort is a great place for people to bring their recreational vehicles. We have 30 and 50 amp RV hookups available to accommodate all sizes of RVs. Our RV campground's full hookups come with electricity, city water, and sewage included, and there are dry storage, outside storage, wet-slip storage options on site. Pets are allowed with RVs. 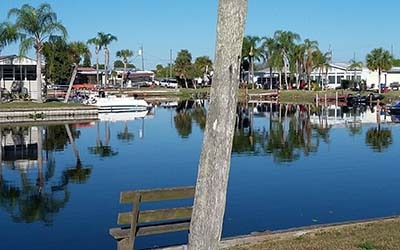 Buckhead Ridge Resort is quiet and peaceful RV park located in beautiful Okeechobee, Florida. Our Park is a great way to enjoy the natural Florida wildlife, as well as various activites such as nature walks, biking, duck hunting, and more. We are located on Rim Canal, which is close to Okeechobee Lake, which is famous for crappie, bass, and freshwater tilapia fishing. Fishing licenses are sold nearby if you need them. All our guests have full use of all park facilities, including docks, city water, our boat launch, heated pool, clubhouse, fish cleaning facility, and on-site laundry facility. Stay, relax and enjoy the old Florida atmosphere.